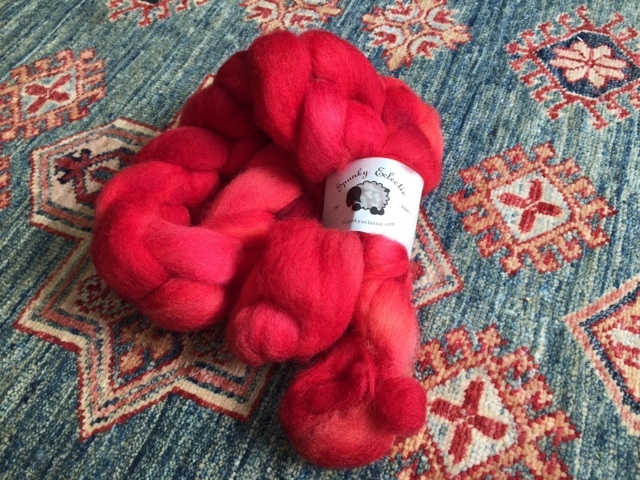 As I was checking out Spunky Eclectic, I saw that their July fibre was a very lovely red colourway called Lobster on two different bases. After some consideration, I decided to get both. The first one is BFL. 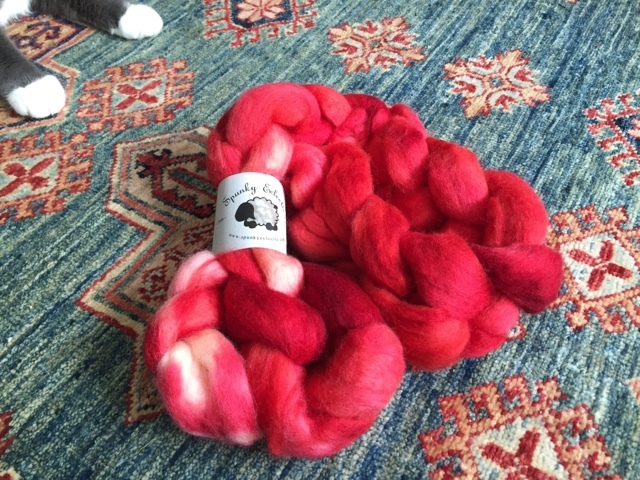 The red colour is so lovely and vibrant, but there are white patches where there is no dye. I am disappointed about that. I thought I bought hand painted red wool, not red and white. Those white splotches will make pink if I tried to blend them. I intended to blend this with the other braid, but now I have to figure out whether to attempt to dye it first or just blend it and hope it won't turn too pink. I do not want any kind of pink. I have even bought the food colouring for dyeing already. All I need now is to pick up the courage and get over the fear of felting the wool. On one hand I love the red parts and I don't want to make them darker. On the other hand, I will never use this wool as it is. I really do not want anything pink. Or maybe I could just remove the white bits and then experiment with dyeing? I'll figure it out. The second braid is cheviot and the colour is perfect. It is intended to become socks for me. With or without the BFL.